Truckee junior Kelly Cross was named Class 3A Northern League MVP and first team all-state for her play this past season. 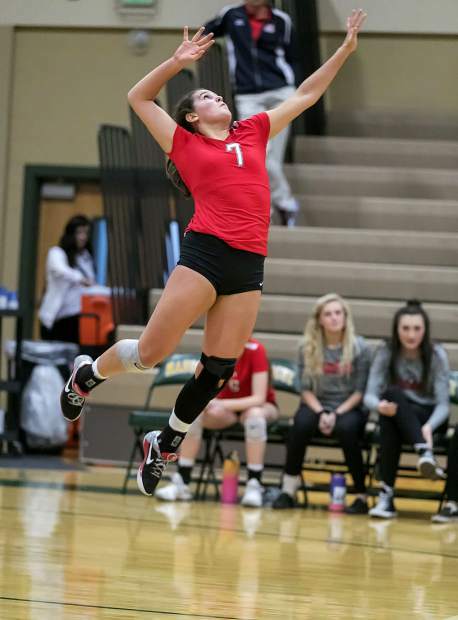 Truckee junior Kelly Cross put together an outstanding season on the volleyball court this past fall, leading the Wolverines to an 18-0 league record, regional championship, and a state runner-up finish. For her play this past season, Cross has been named the Class 3A Northern League MVP and first team all-state. Cross led Truckee with 354 kills, 107 aces and was second on the team with 226 digs. Her leadership on the court propelled Truckee to a Northern League championship, and a trip to the state championship match against Boulder City. Senior Ryleigh Hogland was also named first team all-state, and first team all-league for her play this season. Hogland finished the year second on the team in kills (234), aces (84), and assists (457). Junior Kaley Settle was named second team all-league. Settle was fourth on the team with 128 kills, and led Truckee with 18 blocks. Junior libero Maria “Joy” Galles was also named second-team all league. Galles posted a team-high 289 digs this past season. Junior Morgan Just earned honorable mention honors for the Northern League. Just was third on the team this year with 155 kills. Junior Quinn Kirschner was named all-league honorable mention as a setter, leading Truckee with 563 assists this season.